As big a movie fan as I am I must admit to never having seen the original. Debuting in 1974 Agatha Christie’s whodunit crime drama made a lasting impression. As with the most recent edition it was star studded from top to bottom. Sean Connery, Albert Finney, and Lauren Bacall all made staring appearances to name just a few. The inherent problem with this film and this concept is, once you know whodunit who cares? 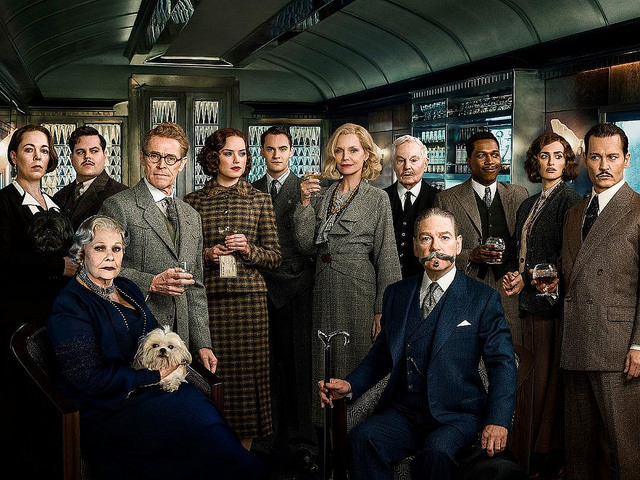 The 2017 remake of Murder on the Orient Express has absolutely no qualms about what has come before. In fact they unabashedly follow suit to pull in a new generation of mystery fans as well as that older class remembering Finney’s performance fondly. Taking over as Hercule Poirot is another talented Brit, Kenneth Branagh. Know more recently for his directing chops Branagh surprises as a funny and foible filled detective. He directs this film sublimely yet highest marks are awarded for his ability to never break or slip out of that accent, not even once. Keeping us entertained as the drama unfolds is a daunting task especially in today’s film climate. Most films today star some costume wearing super hero dodging explosions and aliens every ten minutes. Murder mysteries are a delicate art and keeping this movie a must watch is the collection of talent on that train. Sadly, those of you looking to spend all two hours with Johnny Depp will be disappointed but the ensemble makes up for it. In one club car sit Dame Judi Dench, Leslie Odom Jr., Josh Gad, and Willem Defoe. While each has a flare and distinction only they can inspire together they create a perfect blend. Each demonstrates their professionalism as they feed off the improvised gestures and facial tics of the other. That is talent at its finest. To be able to hold the interest of an audience by acting shouldn’t be as shocking as it is. But the American mindset in particular is good for a ten-minute window and then show the next explosion. God help me I do love to watch actors act and this is a master class in the subject. Branagh with his classical background found a way to accentuate the flavor each actor tossed in the pot. Eerily mellow at times the tone of Orient Express kept you thinking and engaged. I’ve reserved a paragraph here at the end to talk about the amazing Michele Pfeiffer. Since her turn as Catwoman in 1989 she has etched a special place in our hearts, minds, and other regions. Filth aside she brings a smoldering quality to every role she adopts. Beneath the attractive features she is a wellspring of emotion and ability. This role in particular called for her to adopt several personas and she pulled off each with depth, grace, and at times malevolence. This was a great flick!